The carpophore of fungus Ganoderma lucidum (Leyss. ex Fr.) Karst. Or G. sinense Zhao, Xu et Zhang of family Polyporaceae. Mainly produced in Sichuan, Zhejiang, Jiangxi and Hunan provinces. Majority is cultivated minority is wild. Plucked all the year round. Firm, white to light brown fungus flesh. Sweet, neutral; heart, lung, liver and kidney meridians entered. Tonify qi, nourish blood, induce tranquilization and profit wisdom, relieve cough and dyspnea. It is a traditional fine herb of nourishing and tonifying in all the past dynasties, because it can tonify qi of zang organs, nourish qi and blood. It is indicated for syndromes of deficiency and overstrain, weak signs, fatigue and mental fatigue due to deficiency of qi and blood. It is used singly, or combined with qi tonics and blood-nourishing herbs to enhance effect, such as Ren Shen, Huang Qi and Dang Gui. It is indicated for fidgety emotions, palpitation, insomnia, dream-disturbed sleep and amnesia due to malnourishment of heart and mind, deficiency of qi and blood, because it can both tonify heart qi, nourish heart blood and induce tranquilization and profit wisdom. It is smashed into powder for taken singly, or combined with heart-nourishing and tranquilizing herbs, such as Suan Zao Ren and Bai Zi Ren. 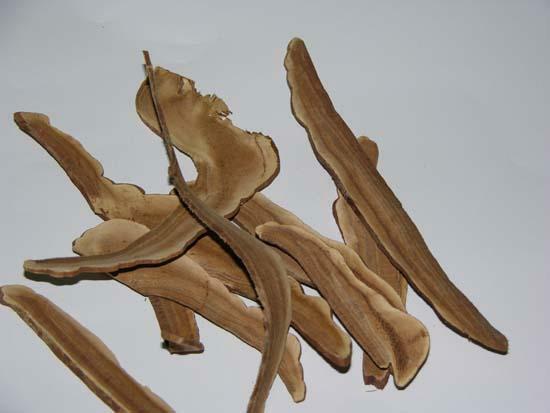 It is indicated for chronic cough and dyspnea due to lung deficiency, because it can tonify lung qi, nourish kidney, and relieve cough and dyspnea. It is used singly, or combined with qi tonics and lung-astringing herbs, such as Ren Shen and Wu Wei Zi. Besides, it also can be used for cough and dyspnea due to turbid-phlegm stagnating internally. Decoct 6~12 g, smash for taking l.5~3 g. Pill, powder or alcoholic preparation are common forms of this herb.